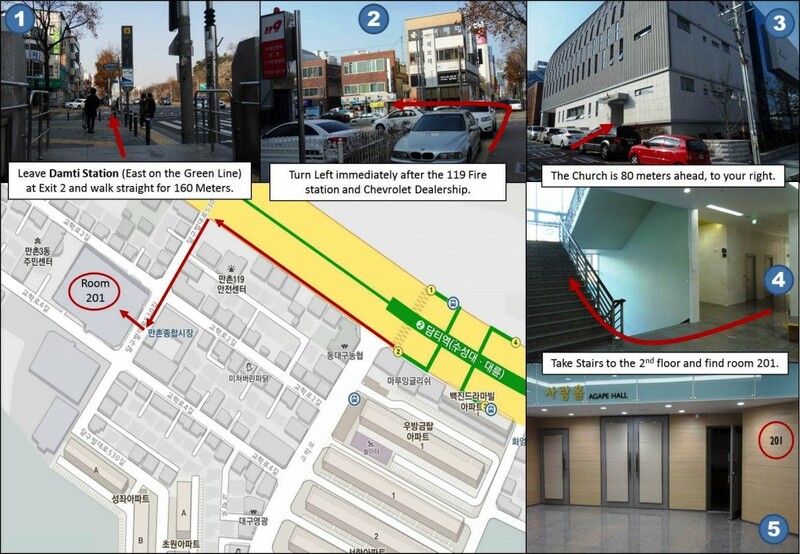 Dongshin English Service is located in the Eastern Part of Daegu, on the green subway line (6 stops to the right of the centre station). Practically this is the easiest way to get to Dongshin, however it is more costly. Show the taxi driver the Korean address above – it usually costs about 5,000 Won from Daegu down town. When you arrive at the church come to the 2nd floor and find room 201. Also easy to reach since we’re close to the subway stop. The graphic above should explain all the details you’ll need. You can also download a copy of that map here. 3. These Buses: 724, 309, 909, 990, 100, 509, 649, 840, 349 go near our church or you can ask the driver if the bus goes past ‘dam’ ‘tee’ ‘ji’ ‘ha’ ‘chul’ (damti subway station). Once you get of at the closest bus stop, it’s not a far walk to our church building. See the file above for detailed instructions with photos.